burabojunior's levels formed much of the backbone of the Japanese Community Project, featuring thrilling action on an aesthetically pleasing canvas. 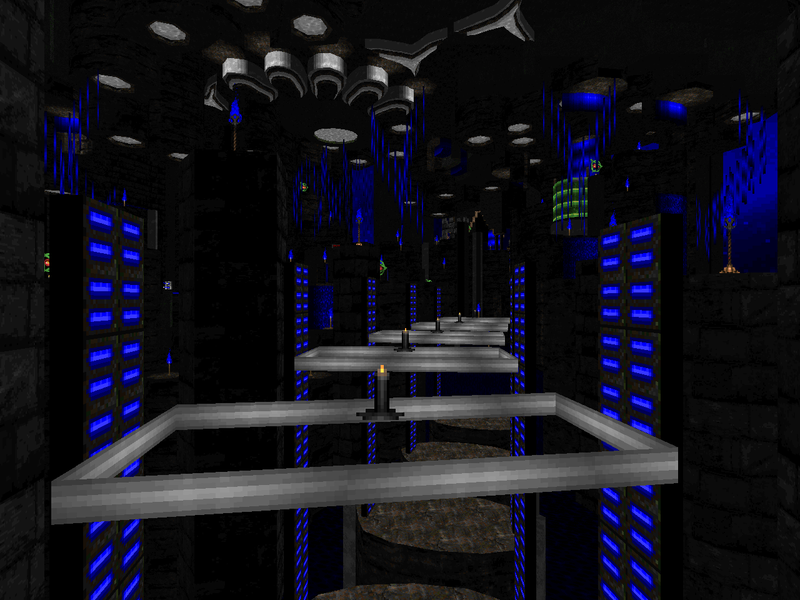 I loved the hidden temple aesthetic of "Riminishi Valley", the orbital platform journey culminating in "Escape From UAC Space Base" backed by Stuart Rynn's "Jailbreak", and the puzzle-driven lethal neon of "Resplendent Emerald Green". 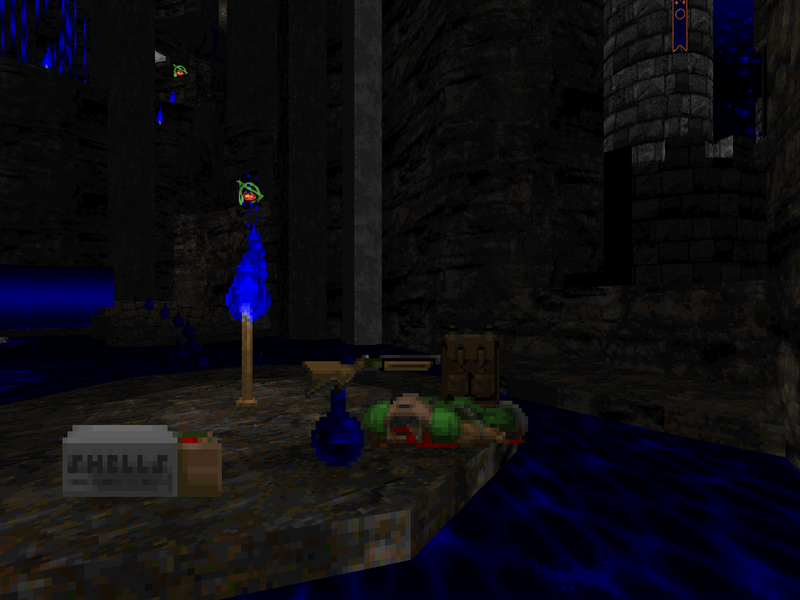 Water Spirit, a three-level Doom II minisode for Boom-compatible source ports, was his 2017 follow-up and in fact first solo release to the archives. I kind of knew what to expect from its look since I'd seen few screenshots in its thread but I could not have guessed where the gameplay would head. 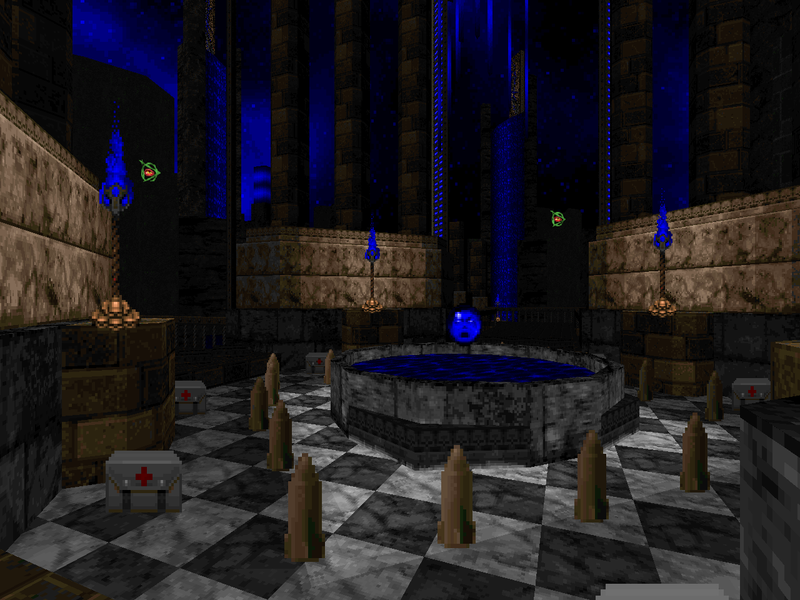 If you loved burabojunior's previous maps but aren't much for surprise slaughter then you'll probably want to dial down the difficulty if you're intent on playing WATRSP, especially since "Aquarius" is such a comparably comfortable lead-in. The opening adventure serves as a warm-up as you navigate its somewhat-confusing organic layout and while it has a few short, sharp shocks the primary threat felt like player exposure, particularly in the case of the flying cacodemons and pain elementals. In this way it sort of echoes Ribbiks's Swim With the Whales except that bbj never approaches its excruciating setups. Water Spirit's exploration of slaughter-style gameplay is more oriented toward fun though for some players any hint of it will be too much for their sensibilities. 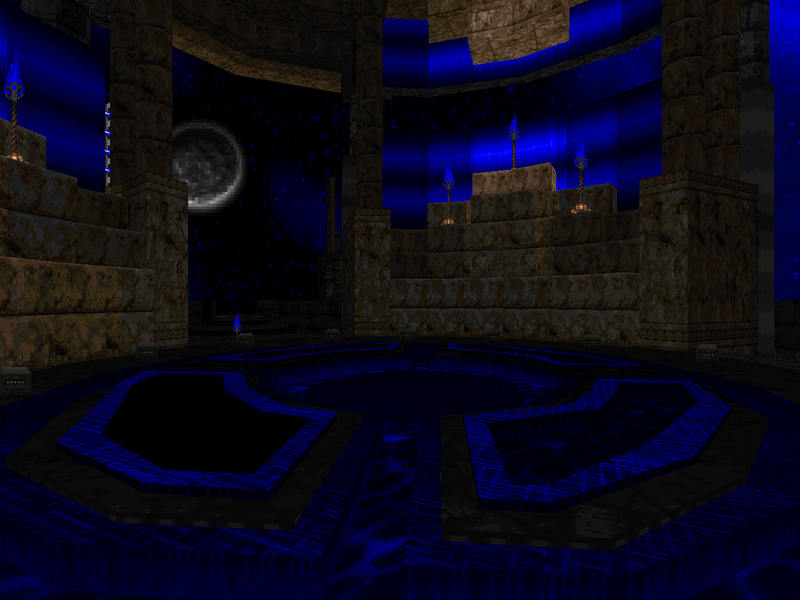 All of it is confined within the Temple of the Water Spirit, encompassing both MAP02 and MAP03, but neither level ever really embraces it for its entire duration. "Part 1" mixes the opener's exposure from fliers and snipers with an more parseable if no less open layout. Once you handle the peanut gallery - after climbing a staircase that's riddled with trash enemies - you trigger the first major invasion, the point of the paradigm shift. It still isn't all that big considering the available playing space or the BFG you then have in your hands but afterward you're free to move on to the blue key shrine. It's the scene of an insane torrent of demons and imps and while neither monster is inherently threatening, the sheer number to combat is daunting considering some of the big cells are in their space. 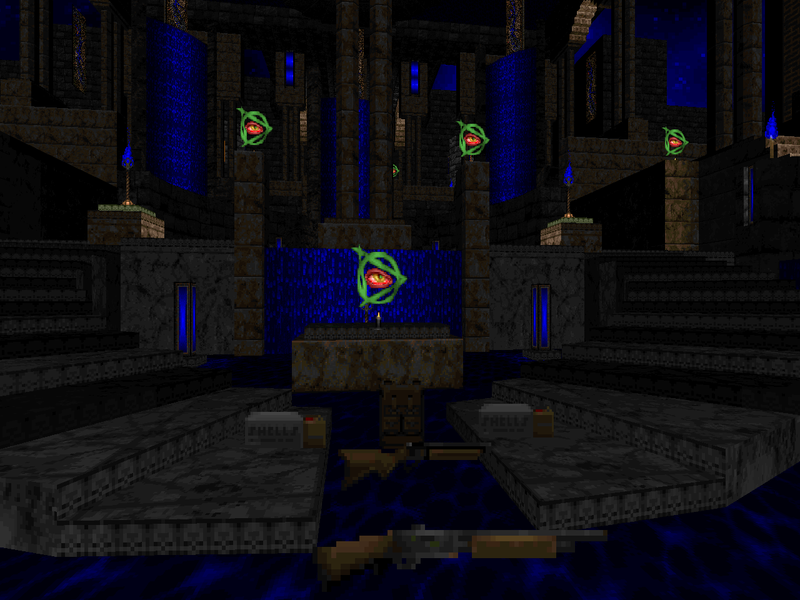 "Part 2" is a great example of small-scale challenging encounters, like for instance the two-staircase teleporter battle in the northern leg where you can either control two avenues with the plasma gun or back down the stairwell at the risk of being forced to retreat into the view of the newly revealed Spiderdemon, thereafter whithering under hitscanner fire. It's all about managing battle fronts, both there and in the southern segment's arch-vile ambushes which threaten to quickly get out of hand. This situation also plays out in the fiery finales of both parts, 1 and 2, just with a horde of the Satanic sorcerers instead of one here or there acting as spoilers. Dialing down the difficulty pays dividends as it reduces the overall forces and in the case of going to HNTR removes some of the stings entirely, like the free-roaming Cyberdemon on the ground floor of MAP02. The arch-vile massacres are the toughest fights of the bunch, I think, and lower skill levels significantly cripple their number. 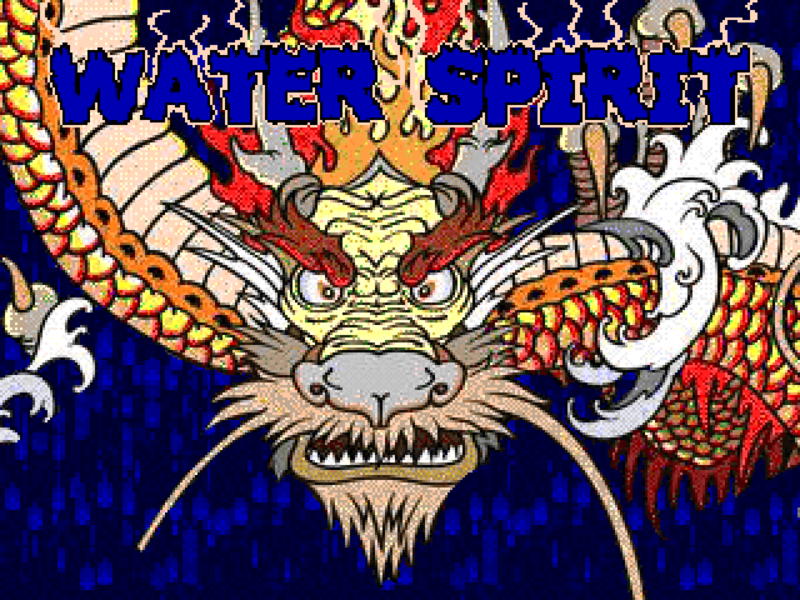 Water Spirit is a beautiful experience; I would entreat you to find a difficulty setting that works for you and then battle it out in the tantalizing temple. At the very least, find a recording of someone else playing or load it up in -nomo in order to bear witness in some capacity. In addition to its combat, WATRSP's appearance seems similar in spirit to the works of Ribbiks. There is a solid color scheme emphasizing one particular tone - in this case, bright Doom blue - and more earthen tones for the terrain and buildings. 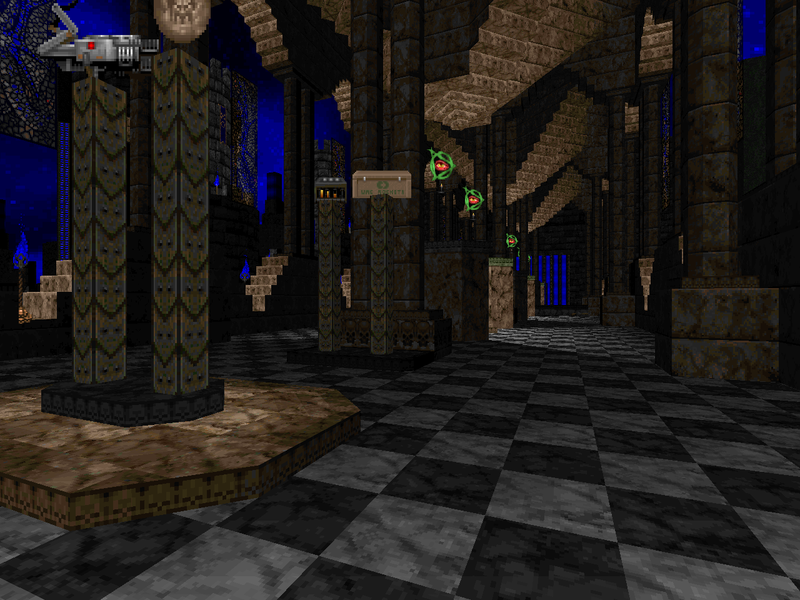 It doesn't leverage dynamic lights to the same extent but the lightcasting is painstaking and I really enjoy the way that burabojunior has used scrolling textures, particularly those emanating FIREBLU highlights in the arcs behind the megasphere shrines in MAP02. 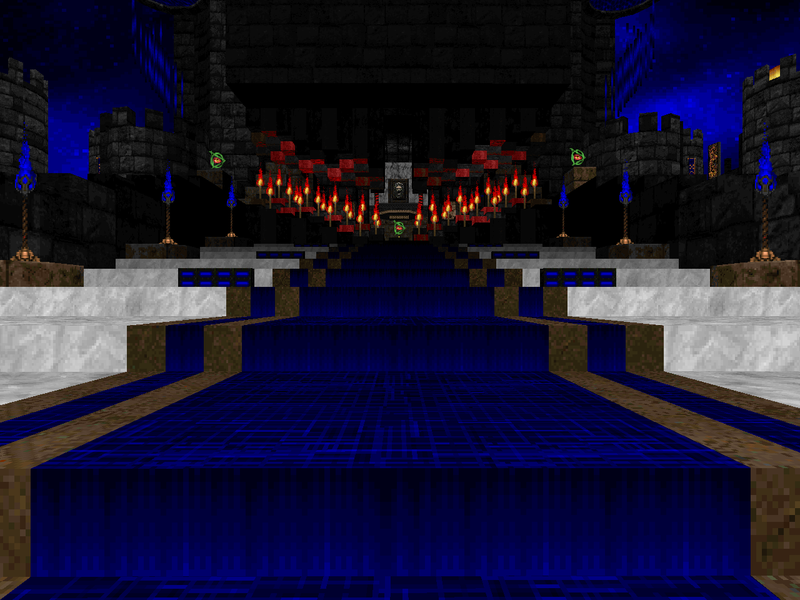 MAP03 dumps the latter element in favor of greater contrast between light and shadow, mostly evidenced in the great hall spanning from west to east. The detailing is phenomenal and manages to avoid getting in the way of gameplay. The most congested portion of the mapset in my mind is the north wing of "Part 2" and the majority of the cool rock garden scenery that you see can be traveled through but does not house any actual combat unless you take it there. You are far more likely to get hung up on a cacodemon a hundred or so feet up in the air than stuff like torches or micro-wall detailing... not that I'm offering the former to serve as an example of a good thing. The geometry of the mapset excels at facilitating smooth player movement. One of burabojunior's goals was to create a slightly moody atmosphere. Between the stunning visuals, macrotecture, and soundtrack (which includes the song that B.P.R.D. composed for his "The Mucus Flow" from Community Chest 2), I certainly felt a feeling of dark wonder as I explored the domain of the Water Spirit. Given the surprises in store, the first one striking me when entering the northwest fortress of "Aquarius", a sense of danger was never far from my mind. The author is thus successful in the intended impression of his work, though your mileage may vary depending on whether you can sneak under the bar imposed by its playstyle. I really enjoyed WATRSP. It's a fun, fast play and fulfills the promise great things that came from burabojunior's works in the Japanese Community Project. Hopefully he is hard at work crafting another great adventure. 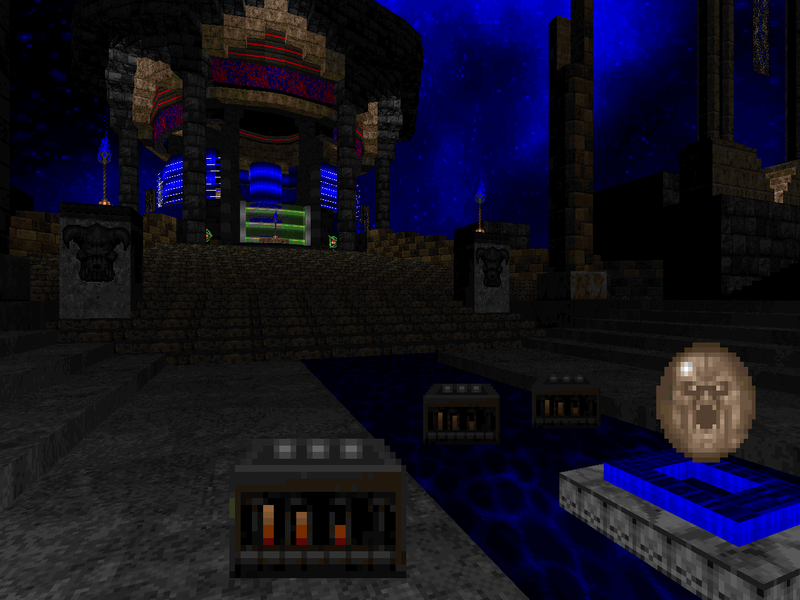 A gorgeous aesthetic of stone and water floating in the eternal aether. The monster usage is never really overwhelming but the open layout gives both the grounded and fliers ample opportunity to surprise you as you explore the irregular layout. I think that sequence breaks may be built into the geometry; at least, it seemed as such when I picked up the plasma gun. I also lucked out because a revenant trapped the audible Cyberdemon and punched away most of his health on its lonesome. No real standout encounters, just some cool moments like the floating details rising up during the hitscanner ambush or the blue key zoom grab. Another freakin' beautiful map. This one is in an enormous shrine and while the organic appearance takes a backseat, the electric blue highlights are here to stay. The level's monster count is deceptive; more than half of these fools ambush you in a seemingly-endless BFG zerg of imps and demons at a critical point. There are plenty of cells lying around; you just have to know where they are and if that fails you can always pull back to a choke point and shell them into oblivion with rocket fire. The opening threat is more insidious given the mancubus and arachnotron snipers but they represent your first major goal toward making the playing area safe. The three slaughter-ish encounters may be a deal-breaker for some, especially the arch-vile backed crowd of cacodemons. That and the mysterious chaingunner race track. Another treacherous fortification, this one balancing the artificial construction with more naturalistic terrain. 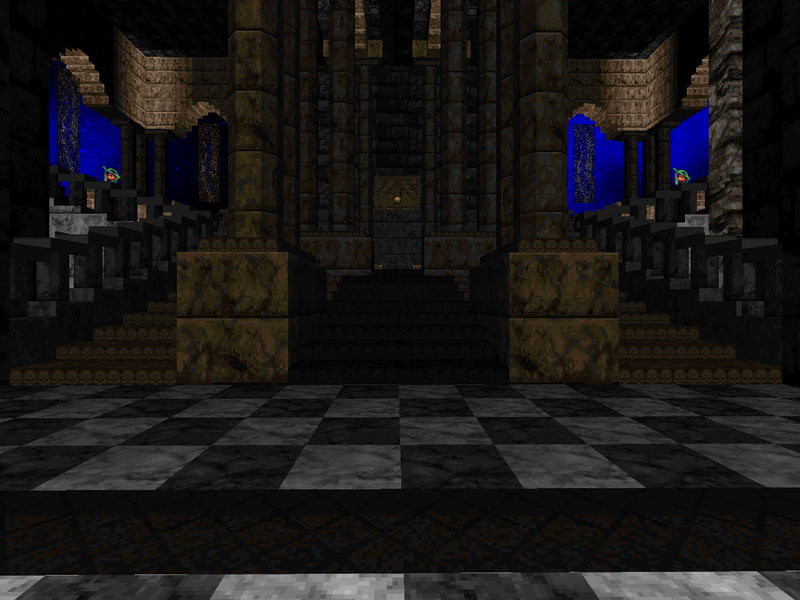 Where the previous level was mostly about battling through open areas, this one's floor plan favors the claustrophobic; the pair of arch-vile guardians that kicks things off sets the tone. You need both keys but you're free to go after them in the order of your choosing. Either leg includes healthy teleporter ambushes where you get to beat back a tide and each one returns you to the central hall. The south gives you a little more breathing room since it isn't as focused on pathways and staircases but it also has a handful of archies running interference at its climax. For my own part, I went north. In any case you'll be treated to a finish that's similar to the previous level but seems best handled by lobbing rockets down the length of the hallway until the tide is about on top of you. Looks like i've got something new to play! 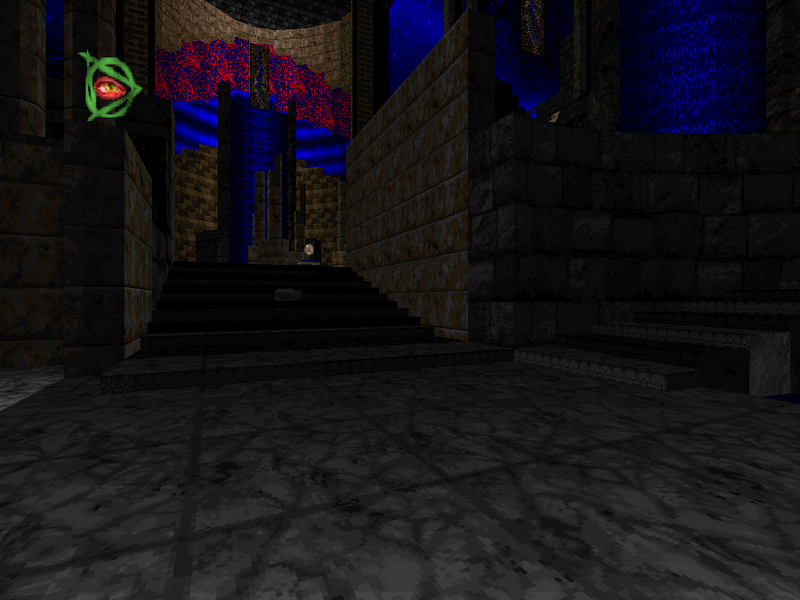 Also could you play and review the Heretic Upstarter Mapping Project (HUMP for short)? 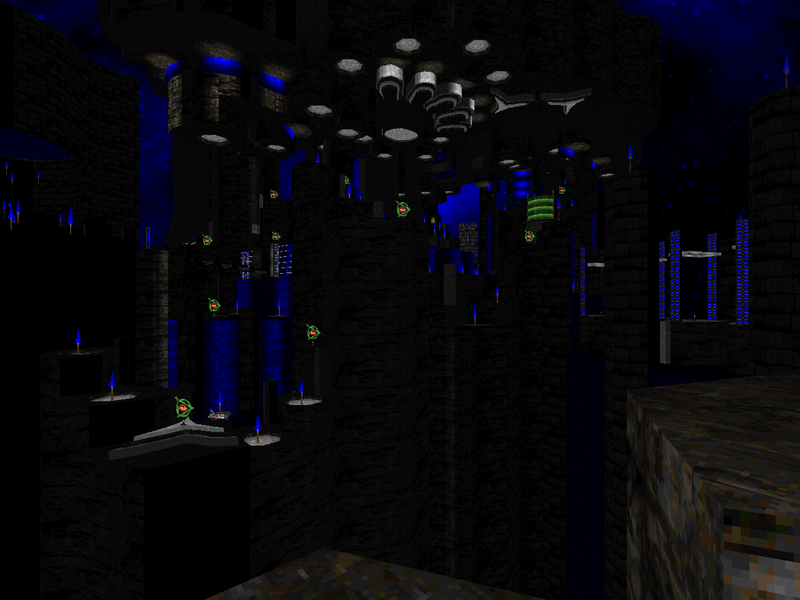 I remember this one from a stream, all the blue everywhere looked astonishing. Excellent review, as always.